I walked in my first college commencement ceremony. Although I graduated in December of 2010 with a B.A. in History and picked up my diploma back in February, putting on that cap and gown and walking across the stage was the official end of my goal. I am done. I can cross this off my list. Did I wish it went faster? Oh absolutely yes. Sitting in classrooms with fellow students and teachers that are younger than oneself can be embarrassing and isolating as my life experiences as a parent/wife/caregiver and a child of the 80's (let's hear it for when MTV was good!) automatically separated me from 90% of the classroom. Those feelings usually went away within a few weeks of each semester and I would find myself one or two or even a group of new friends who didn't seem to care that I could have been their mother. The weird juxtaposition of enjoying the experience/wisdom of my age with the feeling that I am still 18 inside battles inside of me, even now. Will that ever go away? Wednesday evening I whipped up a little quilt block I call The Commencement Block and attached it to the top of my cap, just for fun. 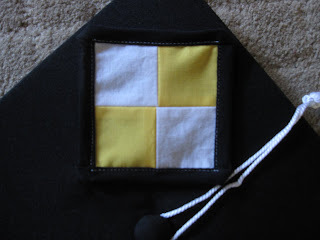 I went to watch my fellow history majors walk last year and saw that people decorate their caps in various creative ways so I decided to put my own quilting stamp on mine. It was an amazing day that never could have been realized without the support of my husband who has been with me practically since day one. When I took breaks he supported me and when I started up again he again was there for me. About five years ago I took a 7:30am class with a favorite teacher and that left him to get the boys ready and taken to school two mornings a week for a semester and let me tell you, that was HUGE. Good friends and family all joined me yesterday to celebrate and for that I am grateful. Their emotional support over the years along with numerous child pickups from school when I had a class that ran late were crucial to getting me to today. Congratulations Susan! A wonderful achievement. Love the cap. I can see you doing a story quilt a la Mary Lou Weidman stye with you 4-patch hat as the focal point. Congratulations, good on you!!! Forget about how old you are, you look fabulous! Congratulations! Bask in the moment! You deserve it. It is my opinion that education is wasted on the young anyway! They have no idea how to appreciate it.